Missiles ‘Will Be Coming’ at Syria, Trump Says. Beyond That Lies Uncertainty. Two Defense Department officials said the Syrian military had moved some of its key aircraft to a Russian base, assuming the Americans would be reluctant to strike there. Russian commanders have also moved some of their military forces in anticipation of American action. By The New York Times | Sources: Conflict Monitor by IHS Markit (control areas as of April 9, 2018). Military positions for Russia and Iran and its proxies are from the Institute for the Study of War. Mr. Trump said earlier this week that he would respond to Saturday’s suspected chemical attack within 24 to 48 hours. But the move toward military action has slowed as the administration sought to coordinate with allies, including France and Britain. 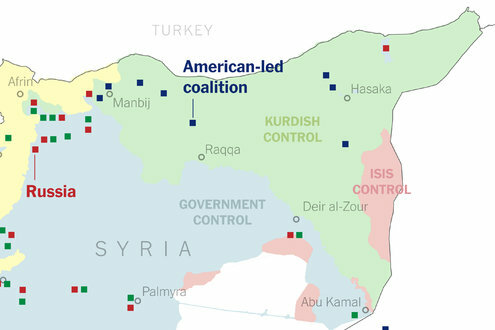 A joint operation takes longer to organize but would avoid the United States looking as though it was acting on its own. Prime Minister Theresa May of Britain called a cabinet meeting for Thursday, and the BBC reported that she was ready to join a military operation without seeking approval from Parliament, as her predecessor, David Cameron, did in similar circumstances in 2013 only to be rebuffed by lawmakers. Mrs. May ordered British submarines to move within missile range of Syria, according to The Daily Telegraph. President Emmanuel Macron of France, who is scheduled to visit Washington this month for a state dinner at the White House, has made clear that he is determined to participate in a strike as well. France has warplanes armed with cruise missiles in nearby Jordan and the United Arab Emirates. Mr. Trump left little doubt about his intention with an early-morning Twitter post on Wednesday. Sarah Huckabee Sanders, the White House press secretary, said on Wednesday that the president was not violating his own policy because he did not give a precise time for the attack to begin. Few, if any, doubt the American capacity to inflict damage on Mr. Assad’s government. But it remains unclear whether the operation envisioned by Mr. Trump will be any more meaningful than a cruise missile strike he ordered last year after a chemical attack. That strike hit a Syrian air base that was up and running again within 24 hours. Military operations can produce unintended consequences and diplomatic nightmares. President Bill Clinton’s airstrikes against Al Qaeda targets in 1998 missed Osama bin Laden in Afghanistan and hit a pharmaceutical plant in Sudan that turned out not to be the chemical weapons facility American intelligence analysts thought it was. Mr. Clinton’s air campaign to protect Kosovo from Serbian forces a year later resulted in the accidental bombing of the Chinese Embassy in Belgrade. Accuracy of American weaponry has improved since then, but mistakes and limitations remain facts of war. In February, a clash in Syria between pro-government forces backed by Russian mercenaries and a largely Kurdish militia that is supported by the United States left an undetermined number of the Russians dead. Just days later, Syria demonstrated that its air defenses could threaten foreign warplanes when an Israeli F-16 fighter jet crashed after coming under heavy fire, the first Israeli plane lost under enemy attack in decades. In the last three years, the Syrian military has significantly upgraded its air defense systems, mostly with help from Russia, a former senior Defense Department official said. Although surface-to-air missiles would likely threaten American aircraft in western Syria, those jets would be able to fire cruise missiles from hundreds of miles away, either out at sea or over a neighboring country. While Syrian air defenses have the range to hit an American jet flying above a country such as Lebanon, the American military could recover the downed aircrew much more easily, the former official said. With American intentions so clearly forecast by Mr. Trump, the Syrian government has moved aircraft to the Russian base near Latakia, and is taking pains to secure important weapons systems, military analysts said. Russia, too, has had several days now to move key personnel and equipment out of harm’s way. The United States and Russia still maintain a so-called deconfliction channel between American forces at Al-Udeid Air Base outside Doha, Qatar, and Russian officials at the Hmeymim military base in Syria, a Defense Department official said on Wednesday. The Pentagon alerted Russia before last year’s strike to warn its personnel to steer clear. If Russians or Iranians were killed in a strike, it is unclear how their countries would react. The former senior Defense Department official expressed less concern about American attacks on the Russians because of the deconfliction line set up but sounded wary about a missile striking Iranian troops or their proxies. The Iranians, the official said, could easily escalate militarily, by attacking American troops along the Euphrates River in Syria or with Iranian-backed militias in Iraq. Pentagon officials said that even if Syrian warplanes eluded an American-led strike campaign, the United States and its allies could still damage airfields across the country to hamper Mr. Assad’s ability to launch future chemical weapons attacks. That kind of damage, though, would require a sustained strike campaign, likely over several days. Derek Chollet, a senior Pentagon official during Mr. Obama’s deliberations in 2013, said the United States was in a better position now than it was then. After that episode, Mr. Obama dispatched American forces to Syria to fight the Islamic State terrorist group and that experience, Mr. Chollet said, has benefited the United States. Follow Peter Baker, Thomas Gibbons-Neff and Helene Cooper on Twitter: @peterbakernyt@tmgneff and @helenecooper.